Every year on St. Patrick's Day I've blogged about the Irish ancestry of my great grandfather, Barney Newmark. I was named after him through my Hebrew name, בָּרוּךְ (Barukh). He wrote a bio of himself for a "Who's Who" of local businessmen claiming to be a native of Dublin, even though he was almost certainly born on the outskirts of Warsaw, in Warka, Poland. He celebrated his birthday on March 17th, though some documents state he was born on March 25th, and others state April 14th. 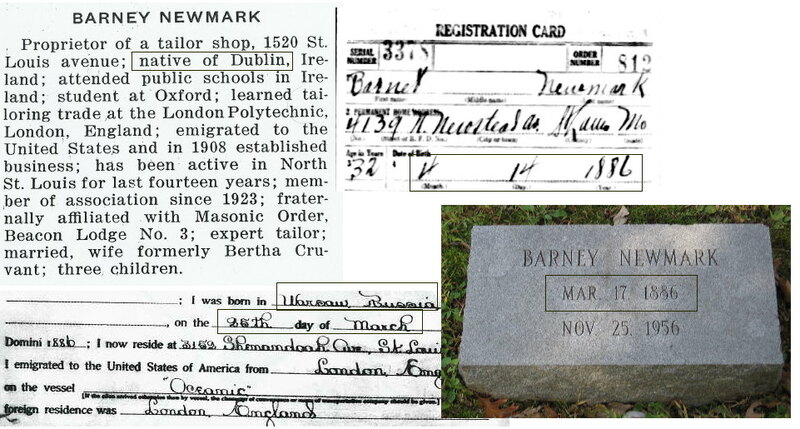 I shared my Irishness with a friend back in 2007, and he looked Barney up in the 1930 US Census, and sent me a link. I've long been interested in my ancestry, but I had done no research, and had no idea what was available online. And here I am seven years later.